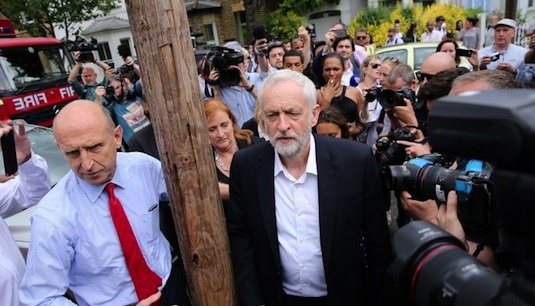 Does Corbynism have a working class problem? No. And yes. Key to understanding how Labour beat expectations is the changing character of class politics. For a moment let's frame the issue with the deeply flawed official dominant conception of class used by the ONS. This divides people into six classifications that are typically grouped together as the ABC1s (managerial, professional, supervisory workers) and the C2DEs (skilled, semi-skilled, unskilled, casualised, unemployed, social security dependent). As a rule the former are the bedrock of the Tories and the latter is is perceived to be Labour's core vote. A highly simplistic bifurcation but one that has legs in our dumbed down political culture. The issue for the pundits, and one the academics are scratching their heads over, is how come Jeremy Corbyn's Labour did well in so-called middle class seats but retreated in its heartlands - places like Stoke South, Mansfield, Dudley, Ashfield, etc. And, in return, why did the Tories do well in these places while conceding Canterbury and Kensington, and retreating heavily in seats such as those held by Boris Johnson, Amber Rudd, and Iain Duncan Smith? The newly emerging class politics offer the best interpretative frame for making sense of these outcomes. If you excavate the data, you find that Labour is projected to have won the election convincingly among working age people under the age of 54. The distortion, of Labour falling back in working class seats, is a consequence of older workers and retirees going for the Conservatives in big numbers across the ONS ranges. Therefore if we're talking about Labour having a working class problem we need to be clear what it is: it's an older working class problem, of the experience of class refracted by an approaching/actual withdrawal from the job market. If we’re suggesting Labour is undergoing a process of recomposition as it catches up with the new realities of class, then as per all processes of renewal some people are going to get left out. Does this have to be the case? Before we go there, what does being working class today mean? For a great many of our people in the C2DE range, it entails the production of information, knowledge, services, care, and social relations. Their labour is largely immaterial in the sense the end product is something intangible. Leaving aside roles often crudely characterised as middle class jobs, consider immaterial working class jobs. What do you produce in a call centre? What do you produce sitting on a till? What do you produce caring for an old person? What do you produce when delivering a pizza, collecting money for charity, inputting data, assisting at the gym? Nothing tangible, nothing that can be taken off and sold like a slab of coal, a piece of pottery, a car. The conditions of work are unchanged, qualitatively speaking. You're still selling your time and ability to work in return for a wage, but what is being produced does have serious consequences for capital. When you're in the business of producing knowledge, information, and services of some description you are dependent upon the employee's capacity to perform socially. Creating new ideas or using interpersonal skills draws on stocks of social knowledge and behaviours that have been learned socially. They are the consequences of cooperative relationships that exist outside of the capital/labour relation and, what's more, cannot be appropriated and hoarded by bosses as a firm might do with the tools or machinery it provides to do the job. Furthermore, the store of social knowledge - what Michael Hardt and Toni Negri call the general intellect - is dynamic, ceaselessly enriched by experience and ideas, and is growing in density as the internet and social media technologies pull us all together into networks. As the general intellect grows, so capital tries to annex and appropriate more of it. It increasingly finds itself in a dependent position and one paradoxically expressed in an intensification and greater visibility of the power relations and exploitation at the heart of capitalist production. It is a lot of precarious working and few prospects, of precarity, misery, and debt. What's this got to do with anything? The development of the general intellect allows for circuits for the sharing of common experiences and new ways for politics to be done. Corbynism, in my view, is an expression of large numbers of socialised and networked workers coming into political consciousness. And, unsurprisingly, as these conditions have spent the last 40 years growing and informing the socialising and subjectivising processes, the younger you are the more likely you work in or have been prepped for life as an immaterial labourer, and the greater the chance you might find Corbynism appealing. The well observed age effect in the 2017 general election is a class effect marking the transition in the composition of the working class away from material and toward immaterial labour. This is why Corbynism is the wave of the future. The Conservative vote performance was based on status groups and class fractions in historic decline. Nevertheless, hubris begets nemesis and it would be a mistake for anyone to sit on their laurels and wait for the tick, tick, tick of demographic advantage and changes in class to grind an election victory out for Labour. It's a good job no one plans to. I'm not content to let old core seats fall to the Tories even if we make up the losses from elsewhere. The first thing to think about is social anxiety and self-security. If there is one thing this election proved above all else, it's that people don't vote for parties that make them afraid. Millions of people didn't vote Labour because of all the well-trailed stories - and not a few lies - written and broadcast about Jeremy Corbyn. Just as millions of people didn't vote Conservative because Theresa May was promising another five years of penny pinching misery. We need to crack this. Funnily enough, one of the key things underpinning anxious political behaviour is the ceaseless change and generalised precarity experienced by younger workers - the children and grandchildren of the voters that lined up behind the Tories. Because opportunity is scarce, whole "traditional" working class communities are emptying of younger people as they go elsewhere for work or education. This demographic drift is simultaneously rarefied (who to blame?) and tangible (look at all the closed shops), so you can understand why a politics based on nostalgia for a past that never was, or blames change on a menagerie of scapegoats, or why people promising to conserve one's way of life might come from and have appeal. The Tories are past masters at tearing up the social fabric and pitching in as the only ones who can ties the threads together again. Secondly, there is the experience of ageing itself. The truism that one becomes more conservative as you get older is false. Rather as you withdraw from work, are somewhat marginalised by mainstream culture, and your earning power is in the hands of the pension provider (whether private or state), you become more concerned with security. It just so happens that the right are better than the left at capitalising on this permanent state of angst. This can be sublimated into all kinds of things, and you just have to look at the stories the Daily Mail and Daily Express run everyday that preys on this position. The demonising of Jeremy Corbyn and the distortion of his politics are of a piece that conjures up monsters to terrify the readers with the view of mobilising them behind the Conservatives. The Mail hates immigrants and Muslims, because Muslims are terrorists. And, oh look, the Labour leader has shared platforms with Islamists in the past. You get the general idea. So Labour are going to let the jihadis run amok. They're going to let the Russians invade. They're going to scrap the army. They're going to expropriate your bungalow and turn your grandkids into fistbumping communists. And worst of all, Labour are not going to spend money on bringing back blue passports. Labour made a good fist of weaponising the security issue, ably assisted by the Prime Minister, but it was only able to make the barest of dents in the Tory lead among older workers. Simply guaranteeing the triple lock won't cut it, so we need to look beyond so-called retail politics. Thankfully there are two interrelated things Labour can do. The first is using the party. When you have a truly mass party, something interesting happens to politics: the party becomes a factor in any election. That's not just in terms of having scores of eager campaigners ready to hit the streets, but in having real social weight in a community. As we have seen from the mobilisation of the socialised/networked workers, support is like a self-replicating virus. It wasn't just the ideas and policies that excited younger voters, but also the fact Labour was humanised via the myriad memes, the myriad people they personally knew in their networks who were party members or supporters. The same applies in the places where Labour lost. Time was the party didn't need to do campaigning as it was part of the communities it represented. It follows that coming back in so-called left behind places must combine recruitment with the usual campaigning activities. Labour has a tendency to just let the membership tick over on its own whereas it should be something heavily pushed at all levels of the party. The more members there are in a constituency, the more likely it is someone who voted Conservative will know a Labour Party member, put a familiar human face on the party, and the persuasion can begin there. Remember, scaremongering is much more effective when the people the press's innumerable 'project fears' address do not have direct experience of the object or the people that are supposed to give them the night terrors. Therefore recruitment is never an optional extra, it is vital to Labour's success. The second is about embedding the party. One of the few good things to have come from the otherwise underwhelming blue Labour tendency was the notion of the foundational economy, those bits of communities that produce the social fabric of a place. If you like, we're talking about the traditional stores of social knowledge - the newsagent who knows everyone, the window cleaner, the postie and the milkman who provide common reference points for everyone, the local pub(s), the community space occupied by schools, and the amenities that allowed these to be decent places to live. In an essay for the New Statesman, Chuka Umunna(!) argued that while New Labour invested in public infrastructure (somewhat problematically) it was indifferent to the social economies that sustained so many communities in medium sized cities and towns. Here Labour, with its huge membership, can fill this vacuum. In the first place by campaigning on local issues that matter. For instance, during the general election Labour had a number of campaign days targeting train stations to make the case for renationalising the rail. Fine and something as a commuter I'm happy with. But there are far more people in Stoke, for example, who use the fragmented and awful bus service, which fails to connect the city up properly and has damaged its social fabric. Here is an easily identified campaigning priority, and one Labour is taking up. Take your pick, every community has amenity issues that need addressing and is where Labour can make a difference. The other is to think about how Labour can build up community power and solidarity outside of campaigning. This is where the varied talents and interests of the members come in because they will know what is lacking and what can be done. The thing is, none of this is new. Labour movements across the West in the late 19th and early 20th centuries laid the groundwork for community infrastructure via their own social security net, cooperatives and friendly societies. How Labour came to weigh its vote in certain parts of the country later was a legacy of this organising role. It is in our party and our movement's DNA to repurpose and rebuild foundational economies and community fabric in the 21st century too. If you were expecting an easy how-to, apologies. Addressing tensions between Corbynism and the working class means being clear which sections of the working class we're talking about. We must ask why some don't like and are not sold on Labour and its leader, and understand how that is the case. Muttering brainwashing isn't going to help. It goes deeper and demands we think about how class and age can intersect and is leading to millions of older people voting against their interests and those of their families. And once we have that understanding, we can start thinking about strategies for winning them back to Labour that do not concede ground to the fears whipped up by the press and the Tories. Hopefully readers will find some food for thought here. Deep thoughts, but where do the robots fit in? Paul Mason's article in today's Guardian described the long-established Japanese drive to develop robots for a surprising range of roles, including social care. And robots need capital, and don't vote. Good points but I was surprised at no mention of Ukip. There was a high correlation in pretty well every constituency between the decline in the Ukip vote and the increase in the Conservative vote (I'm talking about the actual numbers not % or swings). The interesting thing was that Labour also increased their vote such that in a majority of Tory held seats, their majority actually fell because Labour acquired more votes. Contrary to progressive alliance notions, the LD vote was almost identical 2015/2017 in virtually all constituencies ... so the Labour increase did not come from the LD. The Greens either did not stand or their vote was halved and much of that seems to have gone to Labour.. but overwhelmingly, the increase in the Labour vote came from the increased turnout i.e. people who are DK/WV or new to the electorate. Your observation that it was older WC voters who voted Conservative also correlates with the support for Ukip. It will be fascinating to see where that Ukip vote goes. Will it peel away from the Tories following Brexit or a perceived Conservative betrayal of Brexit? A rough tally of 144 English Conservative constituencies showed the majority was down more than 1k in 47% cf 2015; was +/- 1k in 34% and only up more than 1k in 19%. In contrast, of 137 Labour seats, the Labour majority increased by more than 1K in 77%; was down more than 1K in 9% and was +/- 1k in 14%. Also, the old are not going away - there are more and more of them. I suspect the age divide in voting has a simpler cause: older people still trust a few traditional media sources while younger people have learned to discriminate more. It was certainly clear that in the to debates older people's questions could have been written by a tabloid editor, younger people talked about their own experiences. As for Tory losses? Simple enough, they've screwed too many of their traditional supporters. It was notable here in the southeast while canvassing that we had a good reception across the board. Many traditionally Tory people were talking to us favourably because of tuition fees, cuts to the police or armed forces, school funding or simply the rudeness and arrogance of the tories. You're quite right about the effect of a large movement on people's attitudes. Embarrassed lefties in true blue towns have started to lose their shyness. More people than ever before put Labour posters in their windows and gardens. At the count we noted that one of the towns most perceived as Tory was almost 50:50 Labour:Tory. Reporting this fact has had a very positive effect. I'm now no longer the only lefty in the pub, which is nice. I don't think that the younger people of today will get more right wing as they get older. Most people form their ideas at a young age and stick with them. It saves the effort of serious thinking, which most people are averse to, and discouraged from if they exclusively consume mainstream media as older people typically do. Old people are more likely to see the Internet as a threat rather than a resource. One factor that neither the right nor the left seem willing to acknowledge is that most old people are racists. That's not just about fear of Islamic terrorism. They were racists back in the 60s and 70s when they were growing up (when it was normal), and they're still racists now. I left school in 1973. The ONLY politician whom most of my peers ever mentioned was "Enoch", who by the way was also one of the very few politicians habitually referred to by their first name (Maggie and Jeremy/Jezza being the other two). Since the Beveridge report, and the massive successes of the Labour Party, we have pensioners. Pensioners are not only old and no longer working. They are also, by definition, capitalists. Their income is derived almost entirely from rent (in the UK). They are therefore no longer "working class". The ABC1 Social Grade system is not the ONS classification. ABC1 is a market research tool and its manual is published by the Market Research Society. The official ONS classification is the NS-SEC, the National Statistics Socio-economic Classification, which has its (very sociological!) origins in the Goldthorpe class schema. Class, as always, is dynamic because it is in a dialectical relationship with everything else, in particular capitalism. Trying to reduce class down to age categories and levels of precariousness will probably take us nowhere. Voting for a political party is always full of contradictions. Older people, like the rest of us, are making deeply problematic decisions about political leadership. We can easily be waylaid by looking at the never-had-it-so-good ‘baby boomers’ rather focusing on the class-based nature of political decisions. Prior to the crash of 2008, the term ‘class’ disappeared from party political discourse (see Evans & Tilley, 2017) but now it's back with a vengeance. You've caught me red-handed, Anon. Have no idea where I got the idea the ONS used the MRS system. Proof of the plot getting well and truly lost. In short robots promise to exacerbate the tendency toward crisis. If people in ever larger numbers are socialised into the norms and expectations of immaterial labour, and high end immaterial labour at that, we're going to have a big problem when not only are there not enough of those jobs to go around, new jobs aren't being created in sufficient number, and the existing pool is shrinking. Thanks Syzygy. I didn't mention UKIP because I wanted to focus in on this interpetation of Labour's vote, and also because I've written a huge pile on the UKIP/Tory voter base, and how the latter have annihilated the former. You'll find a list of kippery posts toward the bottom of the Economics & Politics page at the top of the blog. Yes SimonB, I have talked about older people's reliance on old media before in my dissections of the Tory vote. It is important to recognise that some of this has been a very long process of taking "Labour's heartlands" and "safe seats" for granted and using them as a means of ensuring selected people get into Parliament without risk (not by any means only the Labour Party that does this, of course: read up on David Cameron's elevation for example). Often candidates with no local connections and not much local interest, apparently. There was real anger from some of the former Labour voters in Stoke, for example, and I suspect the famous "loss of Scotland" has some of that at the back of it. It is not unreasonable for voters in such places to wonder why they bothered. Experience canvassing older voters who used to be Labour and switched (to UKIP, to the Tories) or gave up voting, suggests they may have voted Brexit as an easy-ish way of having a pop at the powers that be. On the other hand, I'm hearing a lot of discontent as to how Brexit is working out (who would have thought?) and that may mean they are amenable to thinking again.